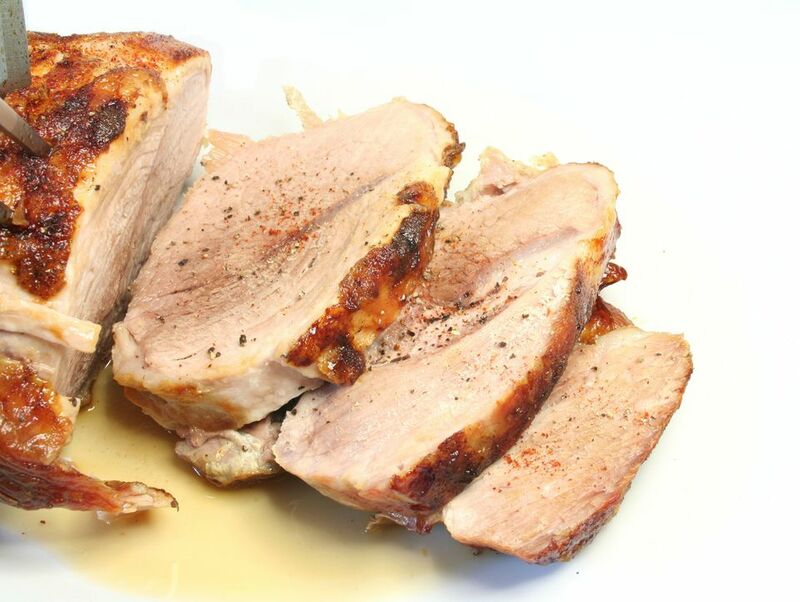 Too often a pork roast is dry and bland; the problem then and now is over-cooking - people were scared of trichinosis and thought overcooking it solved the problem, but this is a shibboleth (see note 1 below). In this recipe, we pack the roast with garlic and rosemary, brown it in olive oil and then slow-roast it to a perfect medium. Using a small sharp, pointed knife, cut 10 to 12 deep slits/pockets into the top of the roast. The slits should be randomly spaced. Stuff each slit with a sliver of garlic and a leaf or two of rosemary. Season all sides generously with salt and pepper. Once the oil is hot (you will see wisps of steam rising) add roast and brown well on all sides. Transfer roast to a rack in a small roasting pan, place in the center of oven and cook until the internal temperature is 145 F for 60 to 70 minutes. Turn roast over at 30-minute mark. Place roast on a cutting board, tent with foil, and allow to rest for 15 minutes. Slice and serve. The meat should be a very pale pink color. Trichinosis is killed at about 132 F.
If you don't already have an instant-read thermometer, you need one. Don’t argue; just get one. Tying the roast before cooking makes the shape more uniform, so it cooks more evenly, and it also keeps the garlic and rosemary from falling out of the slits while browning.